We got a small fixer-upper lake house, and I have been slowly making it our own-on a very very tight budget. I mean, getting it took all our extra money and our first born (kidding..sort of). So we need to live with some things for a while, like the 1970's wood paneling everywhere! One of the cool things we inherited is a gigantic wrap around bench around a farm table. But it needed cushions to make the bench seating comfortable. My head (and wallet) hurt from how many pillows I would need. How to fill the area with cozy pillows cheaply, and in a way that allowed me to clean them easily in case food, crumbs and liquids got on them? First stop, thrift stores. I found pillow forms or even simple pillows that could be recovered. I threw what I could in the wash before recovering. Second stop was digging around my house, finding old toss pillows that were in closets, detritus from redecorating various rooms through the years. Then I bought fabric on sale, much foraged for in the remnant bins of the fabric store. I also picked up grommets in various sizes, and Velcro. You could also grab zippers, but I was trying to be cheap AND easy with my pillow covers. Zippers were too high maintenance for me this go around. I also bought a couple yards of rope edging as well as ribbon and some large buttons. Here were the ideas I had. Pillow idea 1, the open side of the pillow, press the grommets into three holes on each side of the fabric sides. Then cut some ribbon, thread through the grommets and tie closed. Pillow idea 2, make an napkin envelope pillow. Here is a great tutorial using a napkin, but you can cut a fabric to size to make the "napkin" be whatever size you need. Stitch a loop on the end of the flap and sew a button on the bottom to close the pillow. Pillow idea 3 is very simple. Instead of sewing closed the open side, sew two-three small pieces of Velcro to cinch the side closed. I prefer sewing Velcro versus using the adhesive backed ones just to make sure the Velcro will stay. I have not had good luck with adhesive Velcro in my past. Sew those bad boys right on and you know they will do their job for a long time. 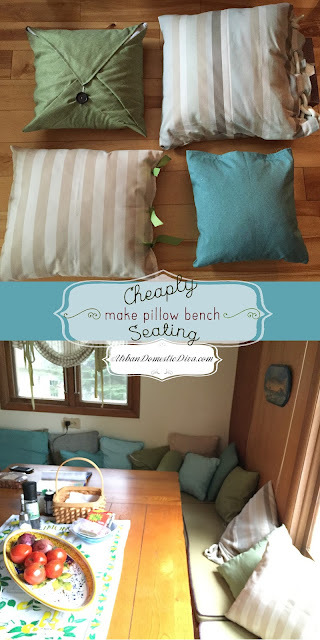 Pillow idea 4 is a version of the first, but using much larger grommets. Then weave a rope, twine or large ribbon through like a giant shoe lace, and make a cool bow or boat knot at the end. I am pretty happy with the result. Cozy, tumbley pillows all over the long benches. Makes you want to roll on in for my hubby's pancakes!